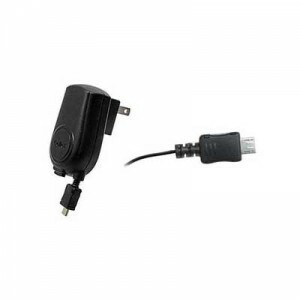 The Micro-USB Retractable Travel Charger features a Micro-USB Retractable cable that extends to your need. With a simple push of a button, the cable rewinds back into the plug for convenient storage. The folding prongs provides added portability. The intelligent IC chip prevents your phone from overcharging. It's compact size and ergonomic design makes the charger a very convenient travel companion. BlackBerry Kickstart 8220, Pearl Flip 8220, Pearl Flip 8230, Curve 8520, Curve 8530, Curve 8900, Pearl 3G (9100), Thunder 9500, Storm 9530, Storm 2 9550, Tour 9630, Bold 9650 and Bold 9700 phone models. Motorola Backflip, CLIQ, CLIQ XT, Droid, Devour, Rival A455, Clutch i465, Debut i856, i890, Karma QA1, Hint QA30, QA4 Evoke, Q 9h, MOTO Z6c, MOTO Z6cx, Adventure V750, RAZR2 V8, RAZR2 V9 (GSM), RAZR2 V9m, RAZR2 V9x, RAZR VE20, Renegade V950, Krave ZN4, Zine ZN5, Rapture VU30, MOTO Z9, ROKR E8, i9, U9, i576, i776, Entice W766, Crush W835, Quantico W845, VE440, Barrage V860, i410 and Brute i680 phone models. HTC Droid Incredible, EVO 4G, HD2 (T-Mobile), myTouch 3G Slide (T-Mobile), HTC Desire and Nexus One phone models. LG AX155, Banter AX265, AX300, AX310, Swift AX500, Rhythm AX585, Glimmer AX830, CF360, Secret CF750, Incite CT810, Shine II GD710, GR500, Arena GT950, eXpo GW820, Rumor2 LX265, Rumor Touch, LX290, LX370, LX400, Lotus LX600, Lotus Elite LX610, Remarq, Lyric MT375, Wine II UN430, Mystique UN610, UX220, Wine UX280, UX300, UX310, Bliss UX700, UX840, UX830, Cosmos VN250, Ally VS740, Fathom VS750, VX5500, Accolade VX5600, Glance VX7100, VX8360, VX8610, Chocolate 3 VX8560, enV2 VX9100, enV3 VX9200, Versa VX9600, VX9700, enV Touch VX11000, Chocolate Touch VX8575 phone models. Nokia 1006, 1606, 2605 Mirage, 2705 Shade, 3606, 6205, 6350, 6500 Classic, Mural 6750, 7205, Twist 7705, E72, N85, 8800 Arte, 8600 Luna, N97 and N97 Mini phone models. Treo Pro and Treo 800w phone models. Samsung Strive A687, Flight A797, Mythic A897, Code i220, Exec i225, Intrepid i350, Omnia 2 i920, M220, M240, M320, M330, Seek M350, Rant M540, Exclaim M550, Reclaim M560, Highnote M630, Moment M900, Stunt R100, Stride R330, Freeform R350, Freeform R351, TwoStep R470, Messager II R560, R850 Caliber, Instinct HD S50, Behold 2 T939 and Reality U820 phone models. Cricket MSGM8, HP iPAQ Glisten, Huawei M228, Kin One and Kin Two phone models.